After looking to the specs I decided I’d like to have one with as much ‘real laptop’ capabilities as possible, because it would be a replacement for a ‘real’ laptop. 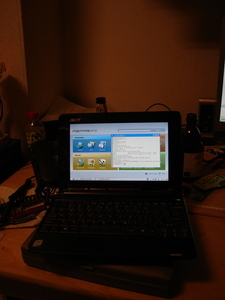 Therefore I choose the Acer Aspire One A150-Ab, with Atom dual core 1,6GHz processor (32bit only unfortunatly) 120GB hard disk and 1GB ram, and Linpus Linux (derived from Fedora) preinstalled. 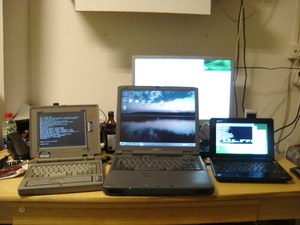 The Ateros wireless and Intel graphics should work out of the box with any linux distribution. The display resolution of 1024×600 is still usable to work with most times. When I pressed the power button the first time I was suprised by the fast boot time. After filling in information about country and timezone, everything works well with the nice looking Linpus XFCE interface, including wireless connection to my WPA2 network, firefox, OpenOffice, etc. Also some software updates where popping up after a while, nice to see Acer tries to keep the system secure. I wanted to log to my remote shell server with mutt and irssi and pressed ALT+F2 and xterm, but ssh was not installed. That could easily be solved by running yum install openssh-clients as root (using sudo bash to become root). Then I saw ipv6 is not enabled by default. 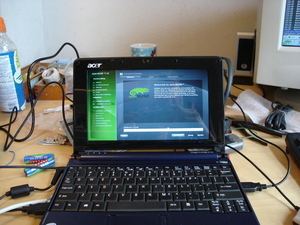 On http://the.taoofmac.com/media/Acer/Aspire One/AA1notes.html valuable information can be found to configure and extend the LinPus OS on the netbook, like installing software and compiling kernel modules. Download the kernel, it can be found here or if it becomes unavailable, here Warning: as of november 2008, not maintained! Make menuconfig doesn’t work properly right now, maybe some libraries are missing? After all LinPus is nice, but I’m used to do my work with OpenSUSE in a KDE environment. Of course I can find my way to install KDE and all necessary packages like development stuff, apache, PHP and MySQL on LinPus, but probably the best solution is to try and install OpenSUSE on it. As far as I know you have to use OpenSUSE 11 at least because OpenSUSE 10.3 has a 2.6.22 kernel, too old for the brand new hardware, especially the LAN NIC driver. Next, the software manager of 10.3 is way to slow, the one in 11.0 is a big improvement. Valuable information can of course be found on the OpenSUSE wiki: http://en.opensuse.org/OpenSUSE_on_the_Aspire_One. You also can choose to use a whole 60GB /home partition encrypted, or even an entire encrypted LVM parition. I don’t want that, because of the performance and battery live loss caused by the encryption overhead. I choose for a non-encrypted /home because I still can use music and video files without the encryption overhead. Disadvantage of this is that you have to think about the sensitivity of the data in your home dir all the time. The alternative would be a crypted /home and uncrypted /home/share for media files, like I have on some other computers. I choose to install KDE4 as my desktop environment. Later on, I replaced it by KDE3.5 because in my opinion KDE4 (even KDE 4.1) is very good looking, I didn’t find my way everywhere and it’s not stable and production-ready enough. I afterwards edited /etc/fstab and added noatime to all fs entries. Not really necessary with a real hard disk, but it reduces unnecessary I/O and thus both hard disk and battery live. Edit /etc/sysconfig/displaymanagerand replace DISPLAYMANAGER_RANDR_MODE_VGA=”auto” by DISPLAYMANAGER_RANDR_MODE_VGA=”"
Now you can enable compiz in KDE to get nice effects. Do this in KDE3 by opening Configuration Center (alt+f2, kcontrol ), choosing KDE Components -> Session Management -> Window Manager, choose Compiz here. Of course, make sure compiz is installed. the http://snapshots.madwifi-project.org/madwifi-hal-0.10.5.6/ snapshot for my system. Install make, gcc and the kernel-source and linux-kernel-headers package with yast. This prevents the non-working ath5k driver shipped with 2.6.25 kernel to get loaded. Now reboot your machine. Yes I know this is a Bill Gates way of doing, but it’s the easiest way in this case. Your system should work now with the new driver! Check with lsmod if ath_pci is loaded. If not load it with modprobe ath_pci. There should be a ath0 interface now visible in /sbin/ifconfig. When looking with the KnetworkDaemon or with /sbin/iwlist ath0 scan you should be able to see networks. Update: I now found a way to suspend the laptop directly from KDE by following http://en.opensuse.org/Pm-utils To suspend the laptop, you’ll need to run s2ram -f from pm-suspend. The -f flag is needed because the model is not known to s2ram. You can add a file in /etc/pm/config.d/ like s2ram and add S2RAM_OPTS="-f" to that file. The build-in camera works just out of the box, in AMSN or Skype, with the uvcvideo kernel module. After all, I’m happily working with this laptop now. The keyboard is a thing worth mentioning. 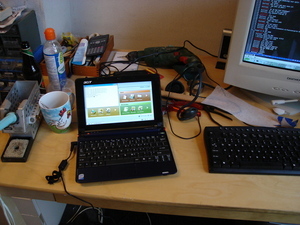 One can type quite well on it, but the control keys like home, pgup pgdown end and delete are difficult to reach. After a month, I’m getting more used to it. This entry was posted on Sunday, November 23rd, 2008 at 9:36 pm	and is filed under English, IT. You can follow any responses to this entry through the RSS 2.0 feed. You can leave a response, or trackback from your own site. Exactly, but “yum install ncurses-devel” will fix it. 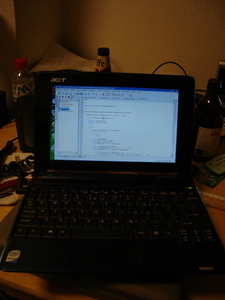 hi bastiaans, can you run the netbeans application on your acer one a150? thanks. Don’t think that would be any problem, if it can work properly with 1024×600 resolution. Did you follow http://madwifi-project.org/ticket/1192 and compile it yourself? Then it should work. But probably 11.1 is a better choice, it is shipped with kernel 2.6.27 with better support for this hardware. I’ll upgrade my own too if I have some time.